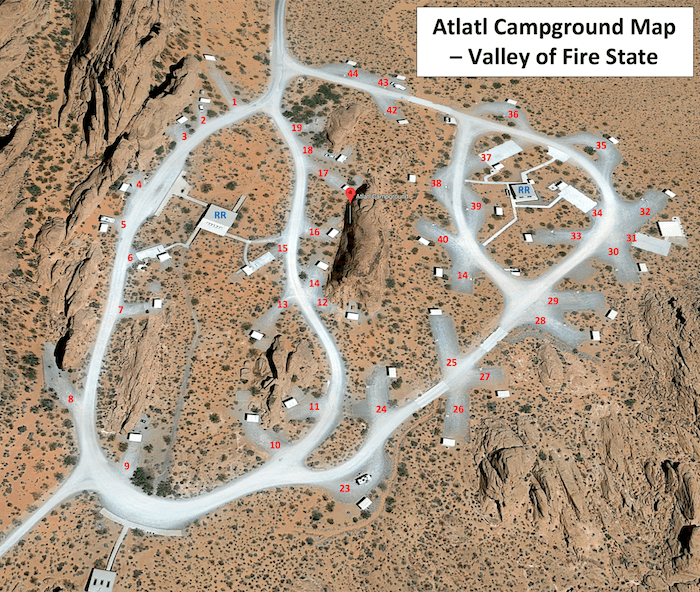 Atlatl Rock campground is located in Valley of Fire State Park and has 44 campsites for tents, trailers and RVs. Campsites 23 to 44 have electric/water hookups at Atlatl Rock campground. Most campsites are large and can accommodate trailers/RVs up to 55 feet+. ADA campsites are 6, 15, 31 and 34. The campground is open year-round and all campsites are first-come first-served (no reservations). You can stay up to 14 consecutive days. Group camping is reservable by calling the park directly at 775 684-2270. Campsites are $20 per night + $10 per night for campsites with utility hookups. Check in is 2pm and check out is 12pm. Vehicles per site may vary and is also at the discretion of the park supervisor. Campground amenities include drinking water, flush toilets, showers and an RV dump station. Each campsite also has a table (some with shade structures), fire ring and grate. Arch Rock campground is another option at Valley of Fire State Park and has 29 campsites for tents and trailers. Valley of Fire State Park is the oldest and largest state park in Nevada and includes 45,000 acres of spectacular geological wonders featuring bright red Aztec sandstone. Contrary to popular belief the valley is not always on fire, but rather derives its name from the red sandstone formations. Valley of Fire State Park offers visitors the opportunity to explore historic sites & ruins, see petrified trees, hike and bike the many trails and visit the full-scale visitor center. Photography, star gazing and wildlife viewing are also very popular activities. Valley of Fire State Park also offers a great base camp for the RiSE Festival each October. Visted Atlatl Rock Campground lately? We'd love to hear about your adventure. Did you find us useful? Did we forget something? Anything our community should know before heading out to Atlatl Rock? Hi! Thanks for all the great info. Are the showers private? Yes the showers are private at Atlatl Rock Campground – Valley Of Fire State Park. Both Atlatl Rock and Arch Rock campgrounds are first-come first-serve (no reservations) at Valley of Fire State Park. Group camping can be reserved by calling the park directly at 775 684-2270. Just a quick question, I’m seeing that the sites with electricity and water are more ($30 per night) But I’m not seeing the price of the more basic ones? Please advise! Atlatl Rock campsites (without hookups) are $20 per night. And, as you noted – campsites with hookups are $10 more = $30 per night. The campground is first-come, first-serve (no reservations). Although you can call the park and make reservations for group campsites. Hello. I’m seeing all the information I need except, what are tent camping check in/out times? How many sites in the Atlati campground have electric and water hookups? I see that there are 44 sites in that campground, but I want to know about the ones with hookups. There are 22 campsites with electric/water hookups at Atlatl Rock campground. Those campsites are #23 to #44. 1/ I read that check-in time is 12PM, and that the campground is first-come first-served. Does it mean there is no need to come before 12PM, or is it wise to come earlier (I plan ti come on July 27) ? 2/ the 4 of us will be travelling in a Jucy Trailblazer (ie a minivan), with no tent. Do we have to stay on a RV space, or can we just stay as if we had a car + a tent ? There shouldn’t be a lot of people camping out at Valley of Fire / Atlatl Rock campground the end of July so you should be fine with arriving around noon to get your campsite. Remember, the days-time temperatures will be over 100 degrees and night-time will be in the low 80s. And as for your other question – you can camp in any campsite that will fit your Jucy Trailblazer . . . either tent or RV site. Many thanks, that’s helpful ! You’re welcome and have a great time at Atlatl Rock campground and Valley of Fire State Park! Hi, I am looking into staying at the campground on Sat Oct 6, with an RV and would prefer an electric/water site. Given that it is 1st come 1st served –1) how early should I plan on arriving to give me the best shot at a site 2) is there a number I can call ahead to find out if there are any sites available on the day of? THis will be on a saturday. I am planning on camping one night on Tues. Nov 6. This will be my first time to visit the park. Do you think it will be hard to find a spot? Arrival time will be after 7 PM. Atlatl Rock campground at Valley of Fire State Park is popular in the fall, but mid-week should not be a problem in finding a campsite. I’d recommend arriving no later than noon though (although check in is 3pm). Have a great time! can more than one vehicle park in a campsite in the north (no hook up) area. Is there a fee for the extra vehicle and a limit of tents per site? At Atlatl Rock campground in Valley of Fire State Park, campsites are limited to a maximum of 2 vehicles and 8 people. Vehicles per site may vary and is at the discretion of the park supervisor. Hello are you open the week of Nov 19 2018. And is there another campground with full hookups at valley of fire? Thanks. Campsites 23 to 44 have electric/water hookups at Atlatl Rock campground. The campground is open year-round (including week of November 19) and all campsites are first-come first-served (no reservations). You can stay up to 14 consecutive days. Is Atlatl campground busy during Christmas. Valley of Fire State Park is pretty popular from mid October through April. Atlatl Campground will probably be busy around Christmas, but may have a few openings December 24-26. Remember it’s first come first serve, so if you live with a few hours of the park/campground – might be a good idea to try and snag a spot on December 23 (for a few days). We are 3 people and planning on camping in arch rock campground on 22nd and 23rd dec. Is it busy at that time? What are the temperatures like? Do we have access to showers in arch rock campground ? Atlatl Rock Campground will be busy around December 22-23 so you should plan on arriving early on the day of your arrival for the best chance of getting a campsite. The campground will probably sell out that weekend. If you arrive on Saturday, Dec 22 you probably won’t get a site. If you live in the area, I’d recommend running out there and getting a spot on Thursday Dec 20 and then come back for your weekend stay. Temperatures will be in the mid 60s during the day to low 40s at night. If you have a campsite at Atlatl Rock campground you can use the showers at Arch Rock campground. Showers are available for only registered campers (either campground) at Valley of Fire State Park. Hi, Is the campground also as busy right after christmas, on Dec. 27-28? I’m just wondering what are our chances to get a campsite if we arrive on the early morning of Dec. 27th? Atlatl Rock and Arch Rock campgrounds in Valley of Fire State Park will be busy after Christmas and through January 6. It will be a challenge to get a campsite during those dates, but arriving midweek (early morning – before 8am) will better your chances of getting a spot. The park/campgrounds remain busy until May. We were hoping to stay there March 31-Apr3 2019. How busy will it be at that time of year. Valley of Fire campgrounds (Atlatl and Arch Rock) will be busy that week. It’s spring break for many CA schools and it’s generally busy anyway because of the good weather. Best to arrive as early as you can on March 31. Hello, we planning on staying on your campground june 7th. We know its going to be hot and all. But do you think we are the only ones that night? Or will there be some more campers? The # of campers will tail off in June, but you won’t be the only ones camping at Atlatl Rock in early June. Over the June 7 weekend the campground should be at around 60% of capacity, but could be more if weather is “mild”. We are driving 25 ‘ RV and plan to arrive Sat Jan 26 from Las Vegas. Can’t get away super early as we are just picking up the rental. Will it be very busy then? Have visitors been down since the government shut down? Thanks for your advice. Yes, it will probably be busy at Valley Of Fire State Park campgrounds (Atlatl Rock and Arch Rock) the weekend of January 25-27. Late October through early April is the busy season there. And since it is a ‘State Park’, it has not been affected by the partial shutdown of the federal government. Valley of Fire State Park – Atlatl Rock campground does have several campsites that will accommodate a 40 ft 5th wheeler. With that said, February is a popular tine and it will be busy. I recommend avoiding weekends if possible and if not – try and arrive on Thursday. How many of the the Atlatl Rock campsites can accommodate a 45 foot motorhome? Hook-ups would be nice, but I’m mostly wondering about room for an RV that size. Thanks for your help! Most of the sites at Atlatl Rock campground are large and can accommodate a 45 foot motorhome. The Ranger will assign a campsite that works for you. we plan on arriving this sunday, feb 17th. Given that we are a 9 hour drive from the park, we won’t arrive until at least 3:00 p.m. Will all sites most likely be full by then? If so, what are alternatives for tent campers nearby? Atlatl Rock or Arch Rock campgrounds at Valley of Fire State Park should have some spots since you’re arriving Sunday, February 17. 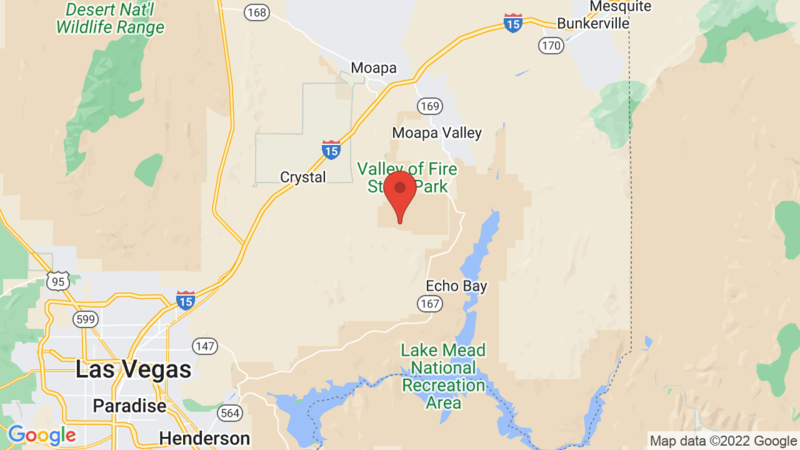 If both campgrounds are full, you closest option would be Echo Bay campground on Lake Mead. It’s about 23 miles (40 minute drive) from Atlatl Rock campground. You can then drive back to Valley of Fire early Monday to try and get a site if you like. We would be there Apr 11-13 We driving 8 hours to get there and worried about first-come, first serve because we already tried to make reservations at Echo as a back up and they are booked. Everything says arrive early. What time would we need to arrive to get a spot? Do people start lining up? Yes – that will be a very busy time (spring break). I’d plan on getting there no later than 7AM April 11 to get in line for openings. And the sooner the better. Best of luck! Is there a good place to view wildflowers nearby? Should this be a good year because of the rains? Best time to view? Yes the wildflowers will be spectacular this year at Valley of Fire State Park and surrounding area. Just about any trail in the park, as well as the roads over to Lake Mead (Echo Bay) would be good to view wildflowers. They should be starting to pop up now, but from March to early April will be the best time to view wildflowers. We considering to come visit March 20-23. My wife is confined to a wheelchair and our travel trailer has a power lift. Which sites are handicap accessible? Might one of those be reservable or are they first come first serve as well? March will be a very busy time at Atlatl Rock campground and it will most likely be completely full. You may have a chance at getting a spot if you arrive very early on March 20 (like 7AM) to get in line for those that may leave. With that said, all sites are first come, first serve, including the ADA/handicap sites (6, 15, 31 and 34) at Atlatl Rock campground. Hi, we are planning to visit april 23-26 with a motorhome 36 feet, are the site large enough? Hi Daniel, most campsites at Atlatl Rock campground are large and can accommodate trailers and RVs up to 55 feet. We were looking at coming to the park Sunday Apr 7 – 9 and from other comments it sounds like this may be spring break. Is Sunday a better day to be checking in and do people really line up at 7 a.m. and wait until noon to find out if there is a spot and then check in at 2 p.m.? That seems like a very long time to idle in your vehicle. Hi Suzanne, Atlatl Rock campground (and Arch Rock) are both very popular during March and April (particularly spring break). The campground will sell out each day, but you’ll increase chances of getting a spot with a Sunday arrival. And yes, people do get in line early and wait for cancelations (particular over the weekend). I am planning on coming out May 17-20th, what should I expect weather-wise? Do you think it will be busy? It’s about a 7.5 hour drive for me so I am wondering when I should head out. I don’t want to risk making the drive and not getting a spot! Also, are the showers available at both sites? Are those an extra cost? Thank you! The weather out at Valley of Fire State Park (Atlatl Rock / Arch Rock campgrounds) will be warm and dry in mid May. Expect temperatures in the low 90s during the day and mid 60s during the night. However, it’s always a good idea to double check weather before you go as the area may have a ‘heat spell’ that could drive daytime temps to around 100 degrees. Both campgrounds will be busy on weekends in May, but not as busy as March or April. You probably will have a decent chance of getting a campsite, but you should try and arrive as early as possible on Friday. With a 7.5 hour drive, you should probably be on your way by 6:30am if not sooner. Both campgrounds also have showers; not sure on the charge, but probably about $1-$2 for a few minutes. Hope this helps and best of luck! We plan on arriving later afternoon(2-4 PM) on march 27th. Im guessing the sites with hook-ups will be taken by that time of day, My thought was to dry camp that first night then move into a site with hook-ups the next morning. My questions are, what are the chances of getting ANY campsite that late in the day for our first night (27th)? and, at what time of the day would we be permitted to move into a full hook-up site or do we need to wait for the park ranger to assign a site ? Also, What a great website!! It’s nice to see the questions being answered. lots of good, useful info!! Thanks for the kind words on our website! Hello, we are planning on coming out there next week and are wondering how busy you have been on a Wednesday night. We are going to be driving up and arriving at around 10:00 at night. Valley of Fire State Park campgrounds will be busy in April. I recommend you call the Park directly to check status. Their phone number is: 702 397-2088. Best of luck! Is there a map that shows the layout of campsites at both Atatl and Arch. We are scheduling now to make a trip. Late April/Early May is the thought. What day of the week might provide the best opportunity to snag a campsite? Sorry – there are no campground maps available for Atlatl Rock or Arch Rock campgrounds at Valley of Fire State Park. However, we here at CampsitePhotos.com will create on and get it published. For late April and early May – mid week would still be the best time to get a campsite. If you want a weekend stay, then try and check in on Thursday (getting in line around 7:30AM). Around mid May is when things start to become less busy (due to the heat). We now have the Atlatl Rock Campground Map available on the campground page. Just click on the ‘campground map’ button to view. Hi, will Atlatl or Arch Rock be busy during the week (April 15-18)? When should I arrive for the best chance of getting a site? Arriving on Monday, April 15 early to mid morning would be best. You should have a pretty good sho at getting a campsite at Atlatl or Arch Rock that week. Best of luck!